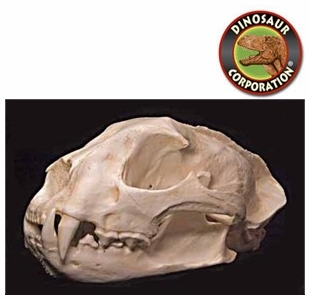 Asian Golden Cat skull replica is cast from original specimen. Felis temmincki. Tibet and Nepal to south China and Malay Peninsula and Sumatra. The Asian golden cat (Pardofelis temminckii, syn. Catopuma temminckii), also called the Asiatic golden cat and Temminck's cat, is a medium-sized wild cat of Southeastern Asia. In 2008, the IUCN classified Asian golden cats as Near Threatened, stating that the species comes close to qualifying as Vulnerable due to hunting pressure and habitat loss, since Southeast Asian forests are undergoing the world's fastest regional deforestation. The Asian golden cat is heavily built, with a typical cat-like appearance. It has a head-body length of 66 to 105 cm (26 to 41 in), with a tail 40 to 57 cm (16 to 22 in) long, and is 56 cm (22 in) tall at the shoulder. The weight ranges from 9 to 16 kg (20 to 35 lb), which is about two or three times that of a domestic cat.